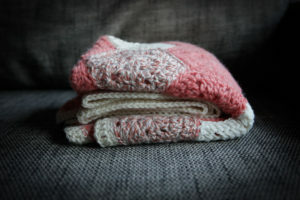 Thirty-Five & Thirty-Six: Blanket bender – I Made That! Part of the thrill of crocheting (I just Nanna’d up a whole nother level with that statement) for me is finding wool at op shops which I can save from landfill and turn into something pretty and practical. A few times I’ve found bundles of a half dozen skeins of the same wool at an op shop, clearly abandoned projects by a fellow crafter. Finding enough wool of the same style and dye lot second hand is pretty rare, so even if I don’t have a project immediately in mind for the yarn, I grab it anyway and wait for inspiration to strike. This habit of mine led to what I am now referring to as my blanket bender. I found 5 skeins of a lovely peach pink 100% wool at the oppy near work and couldn’t go past the $5 price so added it my wool stash. I spent some time wondering what to do with a colour that is neither my style or complimentary to my colouring, but nothing arose. Eventually, I decided that I wanted to expand my crochet skills and learn how to make hexagons. So, I used that as my starting point and got hooking (using this tutorial from Bella Coco). A few hexagons in I realised that the colour of the wool would be perfectly suited to my (then) 7 year old niece Charlotte, so I decided to turn the wool into a blanket for her. In my wool stash I also had a two colour yarn in a darker peach pink and off white so added some hexagons in this style, along with a number of white or off white hexagons to complement. Joining the hexagons as I went meant that I finished the project quick smart! I added a border around the edges to finish it off and after finally blocking the blanket last month (In finished the crocheting in early May), it’s now ready to give to Charlotte on Christmas day. After I realised I had a blanket for Charlotte and had already give one to my nephew Charles when he was born in February, I decided I wanted to make blankets for each of my nieces and nephews for Christmas so they each have something made by me. 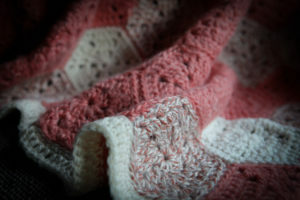 So, I set myself the task to make three more blankets by Christmas (this was in June/July). The second blanket in my bender is for my nephew Noah. 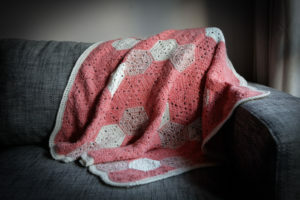 I taught myself another crocheting technique, the ripple blanket, using another Bella Coco tutorial (I think I might have a crochet crush!). It took me a few goes watching the tutorial on slow motion to get the hang of it, but it was pretty straight forward to pick up. 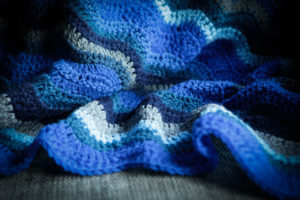 Noah’s blanket is shades of blue and grey, this colour combination in the ripple pattern means it looks a little like the ocean. Again, all the wool was from op shops (some even from Tassie when we went there in June). It does pose a challenge buying second hand wool as you cannot control the ply, I’ve tried to combat this by collecting yarns of a similar ply and choosing forgiving patterns. 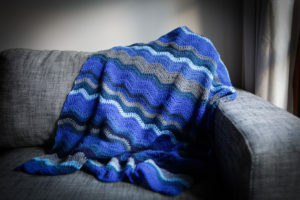 I’ve been doing the same for the other two blankets which will end my bender, which will have to be done by December 24th! I’m really happy with both of the blankets, I learnt a two new techniques as well as the importance of blocking (the process of wetting your project, laying it flat and measuring it out and letting it dry so it is even in size and sits well). With blocking, I think I’ll block hexagons individually in the future to make the size more consistent. And now, to continue my bender….I’m working on a green blanket for Arthur and a purple/navy/deep pink blanket for Evelyn. 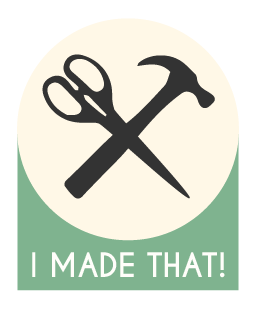 I better get hooking because I need to complete those, as well as a (large) handful of other creations to fulfil our I Made That! challenge of 2017. Stay tuned for Blanket Bender Part II. Note: The main creation phase for these projects took place in April – July, I am only now just getting the chance to sit down and write about them. 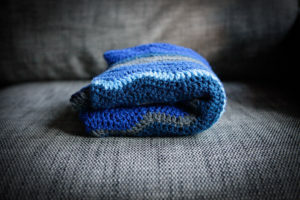 Fourty-Three & Fourty-Four: Blanket bender – Part II – I Made That!